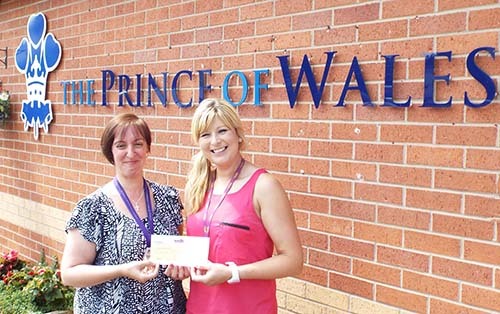 Green fingered volunteers from WDH give The Prince of Wales Hospice a helping hand. 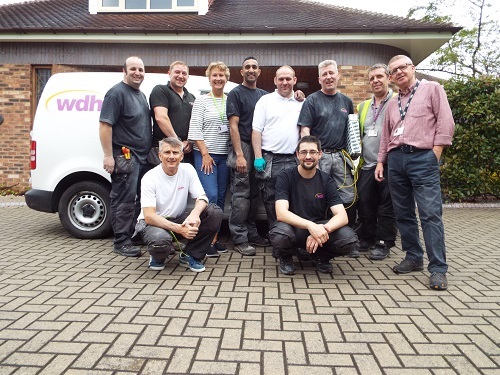 WDH was keen to give back to the Hospice after completing recent environmental and roofing schemes nearby. WDH asked local contractors, who had worked on the sites, to donate money to help replant the garden area near the memorial arch ready for the hospice’s Forget me not event on 1st July 2018. A total of £1,950 was donated by RIM Scaffolding, CPM, MRM, WRPS and Karl Austerfield. The Hospice spent some of the money on picnic benches, plants and flowers for the garden and the rest will go towards patient care at the Hospice. 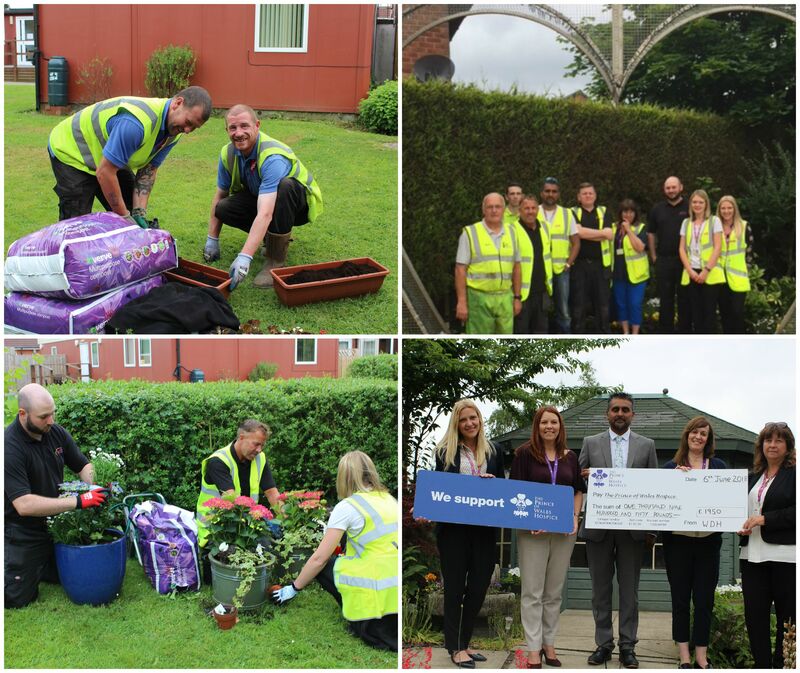 Sodexo, who worked closely with WDH on the environmental works on The Avenues, also donated plants as well as labour to help get the garden looking its best. 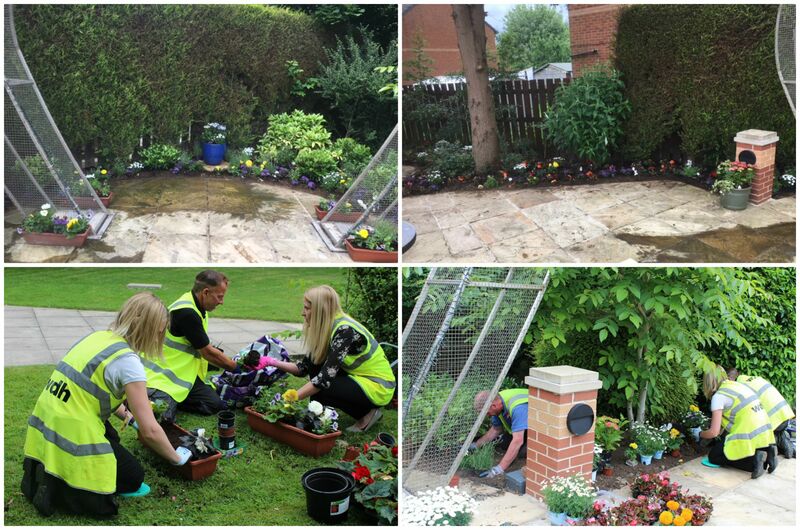 Employees from WDH worked tirelessly to ensure the garden was replanted with blue, white and yellow flowers ready for the event in July and LD Environmental Solutions jet washed the Indian stone patio area around the hospice to make sure everything is looking its best. Residents from The Avenues came down to see the work in the new garden and offered to continue the legacy by signing up as regular volunteers. Paula Hale, Partnerships Assistant at The Prince of Wales Hospice said: “Thank you so much to Pervez, Karen and the team from WDH, Sodexo and LD Environmental Solutions for all their hard work in transforming the garden area surrounding our forget me not heart with some beautiful plants, and the fantastic amount of £1,950 which was raised and donated by WDH contractors. The donation was spent on purchasing the plants, with the remaining going directly to support our patients and their families.